HOLI, the festival of colours, gaiety and gay abandon, is a vernal celebration, which falls on the full moon day in the month of Phalguna. The festival is observed in India, Nepal and in countries with a large Hindu population. According to a legend, the celebration of Holi is connected with prince Prahlad. His father Hiranyakashipu wanted everyone in his kingdom to worship him but Prahlad was a devout worshipper of Lord Vishnu. Unable to tolerate his son’s infringement, Hiranyakashipu planned to kill him. When all methods of killing him failed, his paternal aunt Holika, who was believed to be immune to death by fire, took hold of the child and leaped into a blazing furnace built for Prahlad’s destruction. But Lord Vishnu interceded and when the flames subsided, Holika had perished and the prince came out unscathed. The festival of Holi is, therefore, believed to celebrate Holika’s extermination. The earliest visual representation of Holi celebrations in art is from a 16th century panel sculpted in a temple at Hampi, capital of the Great Vijayanagar Empire of South India. It depicts a king and his queen standing amid maids, who are waiting with syringes to drench the royal couple in coloured water. 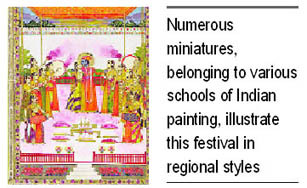 Numerous miniatures, belonging to various schools of Indian painting, illustrate this festival in regional styles. A 16th century miniature from Ahmadnagar in Maharashtra shows a royal couple on a swing while the women around spray coloured water. A miniature from Bundi in Rajasthan depicts a king seated on an elephant and from a balcony above damsels are showering coloured powder on him. 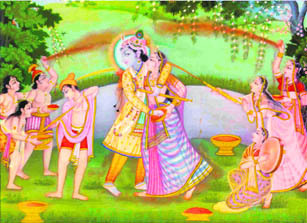 The Holi celebrations, illustrating Lord Krishna applying colour on his beloved Radha and other gopis, find place in various schools of miniature painting collectively called Pahari. This school flourished between 17th and 19th centuries in the states of the Himalayan foothills, extending from Jammu to Almora. 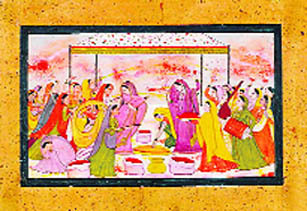 Murals, painted in the 18th and 19th centuries, also provide pictorial description of Holi. Records have found that Holi was one of the most grandiose festivals celebrated by Maharaja Ranjit Singh at Lahore. Preparations made for the day can easily be guessed by the quantity of lac-dye used, touching a fantastic figure of 300 mounds in 1837. The favourite place of the Sikh monarch for celebrating Holi was the garden of Shah Bilawal, where decorative tents were set up and platoons stood on right and left. All princes, chieftains, courtiers and European officers in the Maharaja’s payroll assembled here and played Holi. The celebration acquired the extra element of pleasure on March 22, 1837, when Sir Henry Fane, commander-in-chief of the British Indian army attended the festival. Through the red duststorm caused by the profuse of lac-dye and sprinkling of rosewater, the very face of earth looked red. That Maharaja was fond of celebrating Holi since the prime of his life was evident from a mural in the Lahore Fort painted on a wall of the Sheesh Mahal built by the Maharaja when he came in possession of this fort. Dr J. Ph. Vogel attributed the mural to one of Maharaja’s court painters. 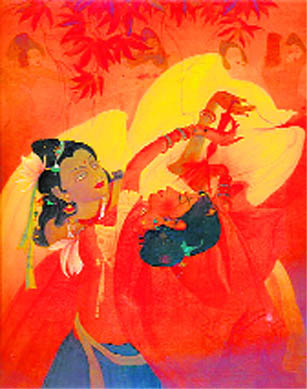 It represented a lively bevy of moving gopis, all of whom were enjoying the Holi festival with Lord Krishna. Despite the anarchy that prevailed at Lahore after the death of Maharaja Ranjit Singh, Holi continued to be celebrated as usual. Maharaja Dalip Singh’s ‘boy regiment’ almost blinded the courtiers with colours. Money continued to be spent lavishly. In 1848, Raja Dina Nath requested Henry Lawrence, British resident and Agent at Lahore, to sanction Rs 20,000 for the festival. Lawrence was surprised at the largeness of the amount but was told that nearly a lakh of rupees used to be spent during Holi. When Jammu and Kashmir became a separate state, the Lahore tradition of Holi migrated to Jammu where it lasted for a week, during which time, according to Frederic Drew, business was attended to in the morning but each afternoon was given to the rites of the Holi. On the last day, Holi was freely played in the streets and no one could complain if pelted with coloured water canons or showered on with tinted water. The patronisation of Holi also came from unexpected quarters. In his Narratives, Charles Masson speaks of the Nawab of Dera Ismail Khan distributing money among his Hindu soldiers to enable them to celebrate Holi in a befitting manner. In 1848, Major George Lawrence sanctioned Rs 1500 among the regiments of Peshawar for the Holi festival. And the age-old tradition continues, bringing together people of all classes. If anyone becomes offended, many will say ‘Bura na mano, Holi hai’ (don’t feel offended, it’s Holi).